Coming in as one of India’s biggest collegiate sports festivals, the 2018 edition of Spree, BITS Goa’s annual sports festival, had the hype train rolling at full steam from the get-go. 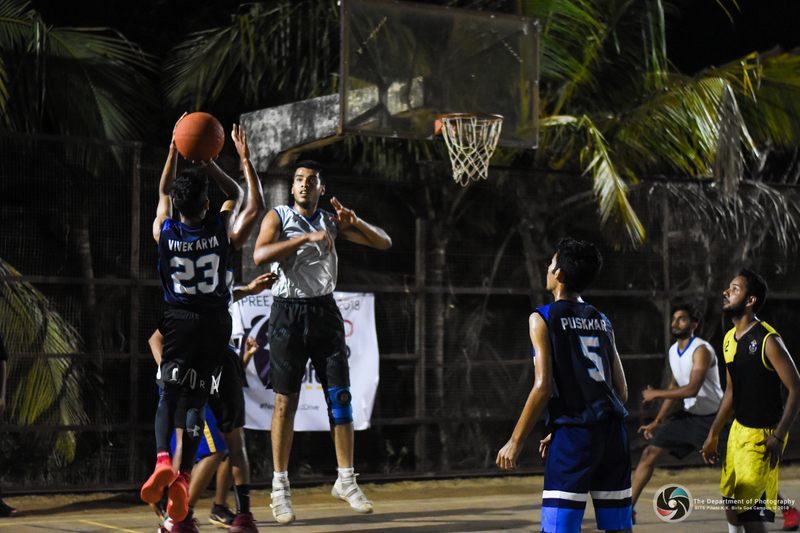 The action began soon after the inauguration ceremony on day zero, with a massive crowd thronging the basketball court, loud and proud, to support the home team, as the BITS Goa men’s basketball team blew out their hapless opponents in a lopsided victory in the first match of the evening. Later that night, the Department of Creative Works organised their first event of the fest, a mock IPL auction, with more events such as a football trade-off, a hogathon, a drinkathon, a paintball arena and more to come over the next three days. Matches resumed on the morning of day one, with the favourites marching through the rounds of 16 and 8, on to the semifinals in their respective sports. BITS FC, the men’s and women’s basketball teams, the table tennis team, and the cricket team, were among those moving on to the final four. The evening featured talks by retired ICC umpire Simon Taufel, and Paralympic Gold medallist and world record holder, Devendra Jhajharia. The former spoke about his experiences as an umpire and the life lessons he learnt from it, while the latter spoke about the challenges faced by differently-abled athletes in India, and his journey to two Olympic gold medals and a world record in the javelin throw, overcoming those challenges, with both speakers giving the audience something to think about. Day two was a mixed one for the home crowd, as the men’s basketball team’s championship run ended in heartbreak in a hard-fought loss in the semifinals to the eventual champions OP Jindal, while the women’s basketball team, and the cricket, table tennis and chess teams moved on to the finals, with BITS FC scheduled to play their semifinal game on day 3. The night of day 2 brought with it a performance by Nucleya, someone who needs no introduction in the Indian dance music scene, as he paired unique visuals with his signature high-energy, bass-heavy sound. The morning of day 3 began with heartbreak for the home crowd, as BITS FC lost the semifinals to eventual champions Jamia Milia, while the table tennis and women’s basketball teams went down fighting in the finals of their respective events to finish at the runners-up position. The evening bore witness to a double-header event in the auditorium as the dance group MJ5 wowed the crowd with their jaw-dropping dance moves, after which comedian Sapan Verma had the audience in splits. Spree 18 raised the bar even higher, being the biggest edition of Spree so far, with close games, sportsmanship, enthralling performances, and overall good vibes, giving all those who attended three days to remember.